I was pulled over last weekend for driving a stolen vehicle. It wasn't actually stolen, it was mine … registered to my name. But, for some reason when the police officer ran my plate number it came up as a stolen vehicle from a different state. I don't know how all this works, but this is the first time I've been pulled over in about 10 years. Yes, I drive like Old Miss Daisy, follow posted speed limits (for the most part), and try to do everything exactly how I'm supposed to. The way I see life, is that, 1) I'd rather not have the drama of being pulled over all the time for speeding. 2) I've found that anywhere I have to go is never more important than the lives of the people around me in other cars, or my own. So, I take it easy when driving. The only reason why that's important for you to know, is because I knew that there was no specific reason why I was pulled over. I had done nothing wrong, and was going 27 in a 25 when I passed him. That's certainly not enough to pull someone over given the margin of error in speedometers. So, I suspected something was wrong. He did not approach the car quickly. He stayed in it for several minutes, and as he did I wondered what was going on. I took my cap off my head and threw it on the dash, then placed my hands on the steering wheel at 10 and 2. One of the most important things you could ever do to ease tensions during a stop is to make sure the police officer can see your hands. In hindsight, I also should have rolled the back window down because it is tinted and not easily seen into. After what seemed an eternity, the driver's side door finally opened and a police officer stepped out. He was average in size, dark hair, and cautiously approached my car with his hand on his taser. 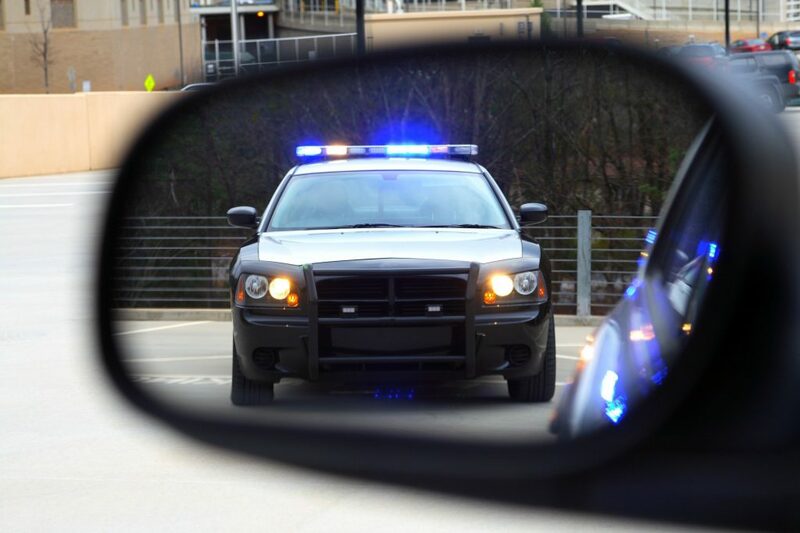 As he reached the back driver's side corner by my taillight, he stopped and gazed at my reflection in the mirror, surely wondering if I was a criminal and if he had said goodbye to his family for the last time. After regaining his composure, he began to swing wide, hand still on taser. As I sit, waiting patiently, I heard my son start to talk. I was driving him to his soccer game, and he was sitting in the seat directly behind mine. He's five years old and this is the first time he'd ever been pulled over before, so he was concerned. He was confused because in my household we teach that police officers are inherently a good force. He also believes that his daddy is good so his brain housing group was desperately trying to figure out why his good daddy got pulled over by the good police officer. As the cop swung wide in his approach, I saw him come closer to me when he saw my hands on the steering wheel, hand still on taser. He asked me if I knew why he pulled me over, and I said I had no idea and that I had done nothing wrong. He informed me that my license plate was flagged as a stolen car, but he ran it several times and it came back as being such in another state. He asked me to show my license and insurance to prove who I was. In Pennsylvania we do not have the duty to inform during a traffic stop if we are carrying a concealed weapon, but this was something I had always wanted to test after hearing horror stories. So, as the conversation progressed I quickly mentioned that I have a license to carry a concealed firearm, and that I was carrying concealed on my person. I wasn't sure how this was going to go, because his hand was on a weapon. He was cautious, probably a little nervous, and definitely concerned for his life–with just cause. Stolen cars are, according to our resident police officers, one of the most high risk encounters police find themselves in. Once I told him I was carrying, his attitude actually changed for the better. He thanked me for telling him and took my info with the hand that had previously been on the taser. He understood at that point, I believe anyway, that I was a law abiding citizen. After all, police usually find out the hard way when a criminal has a gun because they do NOT announce it. They usually just start shooting. The entire ordeal had been a colossal confusion. After he gave me back my papers, he apologized. I told him to stay safe out there as I usually do when I see a cop. He said thank you, walked back to his car and turned off the lights. Now, you may have handled that situation differently. I'm fairly certain that we have readers here who would have denied the cop anything citing the Fourth Amendment. That's up to you, and a topic for another article altogether. But I know how I'd rather handle things, and it involves making the police officer feel as comfortable with the situation as I can so I don't get tasered in front of my son. Now that I've conducted my test, I'll never again inform the police officer that I'm carrying unless I'm in a duty to inform state, or the gun is not on my person like in the glove box. The last thing I need is to not tell the cop and have my FNS9-C fall out when I get him my papers. That'd be an interesting conversation. Then again, I'm not planning on getting pulled over ever again, either. Nor do I ever put my gun in the glove box. What would you have done differently? Let us know in the comments below. Speaking of all this stuff, do you have your attorney on retainer yet? If not, that link leads to a good resource for you when you're ready to interview one. I’m confused. You say by informing the officer that you were carrying that he became more relaxed. Kind of deescalating the situation in a sense. Yet at the end you turn around and say you’ll never inform an officer again unless in a duty to inform state. Seems kind of counterintuitive to the message of your article…. Thanks for sharing. I would have taken exactly the same steps that you did during your traffic stop. FWIW, I always inform the officer when I am pulled over, for whatever reason, regardless of the state I happen to find myself in. I don’t want the officer to be surprised by anything I say or do, nor do I want him/her to misinterpret my movements or intentions. But, like ptrick, I’m unclear how you got to “I’ll never do that again” from a comfortable, relaxed experience. Did I miss something? I would do the same exact thing … but even in a state I’m not required to inform the officer. One thing to stress … though you said you told him you have a CCW license and are armed, it was kind of matter of fact. I would stress that THAT is the correct way to inform the officer … FIRST inform the officer you have a valid CCW permit (if you’re out of your state, I’d add “recognized by your state”), THEN inform him you are armed … not the other way around. If the first words out of your mouth are “I have a gun on my person” he won’t hear anything else you say. I’d also inform him where it’s located (“on my right hip, inside the waistband holster”). So much depends on the cops mindset. If he thinks guns should only be carried by competent professionals like himself, then letting him know you are carrying wont put him at ease. He already knows if you are a CC permit holder when he ran the plates. That has put people I know through extra scrutiny and hassle for no reason. On the other hand, if the cop recognizes the CC guy as a vetted responsible citizen, an ally against the bad guys, then he will be more at ease. You have no way of knowing who you are dealing with until it is happening. Better to adhere to standard protocol in keeping hands visible, dome light on or otherwise improve visibility for him, polite, respectful, etc. Fewer people would have problems with police IF they would remember that most of the people they deal with are not the most friendly. When you start a conversation with a hostile attitude, you are asking for complications. I feel this person did the right thing. Even if the officer would have ordered him out of the vehicle, and frisked him, when he was informed that the driver was legally carrying, this should not bother the driver. It is for the officer’s safety, if the officer becomes abusive, DON’T ESCALATE! Who knows, this officer may have just pulled over a subject who tried to fight him/her. or even shot at him/her. We are responsible for OUR OWN ACTIONS, not the officer’s. There are procedures when an officer is in the wrong. Use them first.